There has been a lot of discussion over at the Guardian Word of Mouth (aka WOM) blog because some people wrote pretty scathing responses to the “Dinner for under a fiver” feature that they ran in their G2 supplement. A lot of the criticism was based around two points: 1) the recipes were boring and 2) they didn’t account for random teaspoons or sprinkles of seasoning when calculating the cost – it might only be a teaspoon or sprinkle, but many people don’t ensure that they have some paprika on hand at all times in order to sprinkle it here or there for “no cost”. Total cost: £4.98, so just snuck in there; we would have left out the bread if we hadn’t managed it. And of course we could use fractional amounts for the butter, spaghetti, garlic and rolls and left out the parsley but wanted to cost all ingredients completely. So, armed with these we got to work. The first course was courgette soup and the second was spaghetti with crab, chilli and garlic. We’ve cooked both of these to varying degrees of success before, but usually with slightly more financial freedom than this, so we had to cut a few corners. The lemon and parsley find their way into both dishes in different ways. We usually make this in a richer style, using vegetable or chicken stock instead of water and adding cream at the end. This is a lighter, more summery version which was cheaper and also seemed more appropriate at the moment. It still contains a fair amount of butter though… better use vegetable oil or olive oil if your doctor is watching. Slice or dice the onion and slice both cloves of garlic, but keep them separate. Reserve half of one courgette and cut the rest into pieces. Melt some butter in a saucepan and when it is hot, add the onion on a low to medium heat. After a few minutes, add one clove of garlic and stir, still on a lowish heat – you want the onions and garlic to soften but not take on much colour. When they are soft, add the chopped courgettes and stir around. You want to get a little colour on the onions and the white parts of the courgettes here, just a light golden-brown sheen – you might need to turn up the heat a bit but don’t let anything burn. When the courgettes have coloured a little, add the parsley stalks and then add just enough water to cover all of the ingredients and let it simmer until the courgettes are soft. While that is happening, cut the reserved half of courgette into julienne sticks. By the way, if this bit sounds like too much hassle, just chop up this half of courgette with everything else in the beginning and put it into the pot! Then melt some butter in a frying pan and fry the courgette sticks until golden brown. Cut the roll or slice of bread into little centimetre (half-inch) cubes. Either in the same frying pan after the courgette stocks are done, or in a different pan, heat up some more butter on a low to medium heat and then add the other sliced garlic clove. Stir this around for a bit and then when the garlic is starting to colour, remove it. This will leave the butter nice and garlicky. Turn the heat up a little and then add the bread cubes, turning them after a short while to colour as many sides as you can without letting anything burn. Now blend the courgettes, onions and parsely to make soup. You don’t want all of the liquid that’s in the saucepan, so if you are doing it in a standing blender, just add the solid ingredients and a dash of water and blitz them, add a little more of the cooking water if it is too thick. If you are using a stick blender in the saucepan, pour some of the liquid out into a separate bowl first and then add it back in if needed. Add the lemon zest and lemon juice and blend some more, then check for seasoning and add salt and pepper – we tend to add quite a lot here! Serve into bowls, and garnish with first the courgette sticks and then the croutons. If you are not trying to do this for under five Pounds, add some cream or use stock instead of water, or cook some prawns and add them whole to the soup. A couple of years ago, we used to eat this quite often. There aren’t that many on Dinner Diary though; we must have gone through that phase before we started blogging. This dish needs nice extra virgin olive oil on it, but of course we couldn’t afford that in this version. We have also tried it with fresh crab, but the delicate flavour tends to get lost if the chilli is too strong and it’s a waste. This is a really quick dish; waiting for the spaghetti to cook is the longest part of it. Put on plenty of water to boil in a large saucepan and when it is boiling hard, add a little salt and put in the spaghetti. Finely chop the chili and garlic. In a frying pan, melt some butter (or heat oil) and fry the chilli and garlic in it, reserving a small amount of chilli. Coarsely chop the parsley leaves. When the spaghetti is cooked, drain it and then return it to its saucepan. Add the garlic and chilli, along with the butter or oil in which it was cooked and most of the parsely. Stir this well. Add the crab to this and stir more gently so as not to break up the crab too much. Season with pepper and a squeeze of lemon. Serve topped with the reserved chilli and garlic. So we made it. The courgette soup initially didn’t seem as interesting as it should do (lack of stock and cream), but adding the lemon lifted it and saved it. 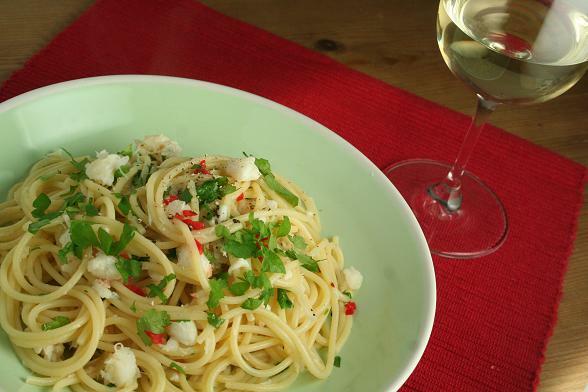 The crab spaghetti was okay, but is better with loads of good olive oil all over it. If we remove from the total cost the left-overs of the ingredients that we didn’t completely use up, we get back over a Pound (mostly from the butter) and I’m sure that could buy us a couple of tablespoons of olive oil to put onto our spaghetti. Maybe even a dusting of Parmesan. Or some nicer spaghetti. We really enjoyed doing this. 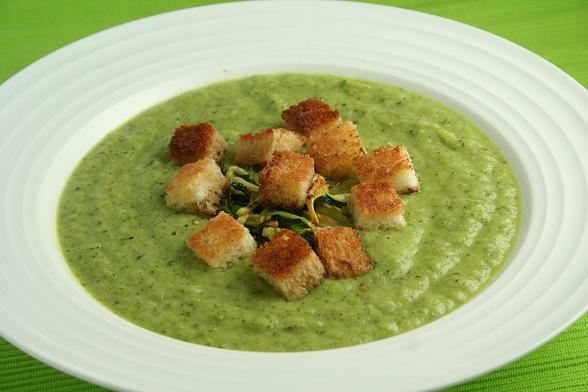 Probably went a bit overboard trying to make the courgette soup interesting with croutons, etc, within budget, but it was fun. WOW!!! This looks absolutely stunning. I will try the soup soon, as we’ve got courgettes growing in our patio, and we always have a glut. Yum! Michelle’s last blog post..My favourite way to eat asparagus! Well done! Saw your link on Guardian site and your two recipes are the first two in the Guardian Comments that I’ve liked the look of and will probably try. Fab photos too. I look forward to reading the rest of your blog. You obviously love food as much as me. 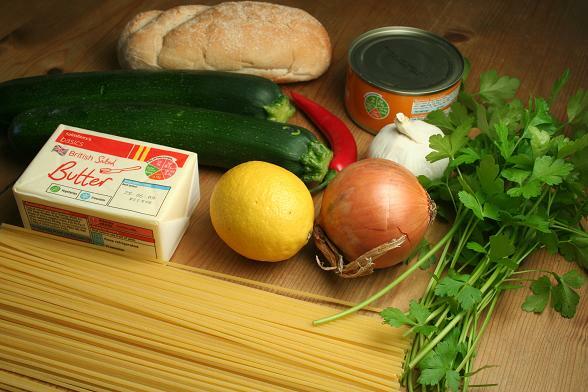 Check out my Courgette pasta recipe (I think it is 2 down from yours). oooh oooh, well done! I am rather tempted to try this myself I must say. Lovely! My dad used to make courgette soup all the time, drizzled with a really fruity olive oil. This has reminded me to try and replicate it. They both look fantastic – really well done. You did a lot better than a certain celebrity chef’s miserable ‘tomato pasta’ effort! They both look lovely. I think that with tightly budgeted meals that you need to work one “luxury” ingredient in; which you have done with the crab, othewise life can miserable. I need to have a go at this, it reminds me of a GCSE history project I did to feed a Victorian family for next to nothing, which was very hard and made me appreciate how lucky I was to be able to eat good food all the time. Thanks everyone! We enjoyed thinking of something that we hoped would be both interesting and cheap. GourmetChick yes I should have checked the can actually to see if it made any sustainable claims but was remiss. Lizzie, some lovely fruity olive oil would be really good in the soup. This is the first time I’ve put lemon into it as I said, and I liked how it turned out. Helen it certainly made us appreciate that we’re lucky that we don’t have to try to do everything under £5 all the time. Although we generally just have one course though, and I’m sure that a lot of the time it’s under £5. What a great challenge. I’m not sure I could have come up with anything as creative but both your dishes look really great.